Aronia - Wikipedia, entziklopedia askea. Aronia Rosaceae barruko landare genero bat da. Bi edo hiru espezie dira, denak Ipar Amerikako ekialdeko zuhaixka kaduzifolioak. Landare ornamental gisa landatzen dira, baita antozianina izeneko pigmentu antioxidante bat lortzeko. Fruituak astringenteak dira gordin janez gero. Eurekin marmelada eta infusioak egiten dira. ↑ «Aronia Medik.» Germplasm Resources Information Network . ↑ «Photinia pyrifolia (Lam.) K.R. Robertson i Phipps» USDA PLANTS . ↑ «Photinia melanocarpa (Michx.) K.R. Robertson i Phipps» USDA PLANTS . ↑ Voss, E.G. 1985. 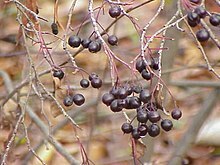 Michigan Flora: A guide to the identification and occurrence of the native and naturalized seed-plants of the state. Part II: Dicots (Saururaceae–Cornaceae). Cranbrook Institute of Science and University of Michigan Herbarium, Ann Arbor, Michigan, U.S.A.
Orriaren azken aldaketa: 30 urtarrila 2019, 20:55.